1. 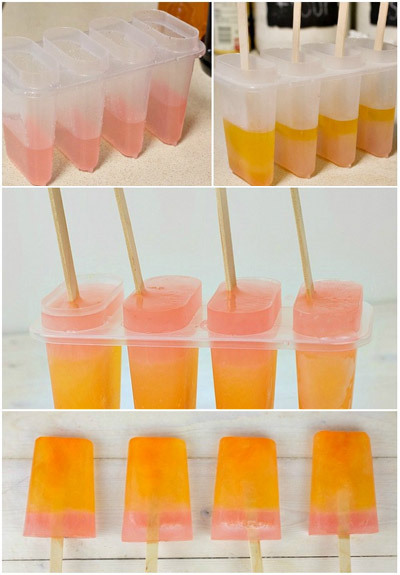 Pour a layer of your orange drink into the bottom of a Dixie cup or your ice lolly mold. You will use one cup for each ice lolly. 2. Put in the freezer for about 30 minutes, until the layer has started to freeze, but isn’t quite solid. 3. Remove from freezer and insert wooden craft sticks. 4. Return to freezer and freeze until layer is solid. 5. Add a layer of pink lemonade drink. Put in freezer for about 30 minutes, until layer has started to freeze. 6. Add in some orange drink and allow to sit for a minute so that it can mix together. Return to freezer and freeze until solid. 7. Add a final layer of pink lemonade and freeze until solid.